David <+> [MU Online Fanz] <+> Official 3rd-party [MU Online] Fan Site & Game Guide! David can create "Lucky Armor" sets which can only be crafted with a Lucky Item Ticket. Exchange the following Lucky Item Tickets for its corresponding armor piece. 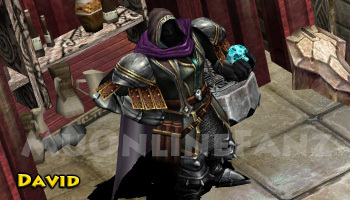 The item received will be based on the character’s class which exchanges the ticket. Armor pieces act as ancient set items and will activate more additional options as you wear more of the complete set. Items received can have a base level of +0 ~ +15 with +Luck and +Option attributes randomly generated. Items received cannot be upgraded. Items cannot be traded, stored, or sold in the personal store. Items can only be repaired via Jewel of Extension, which recovers full durability. Items with zero durability can be refined into Jewel of Extension. 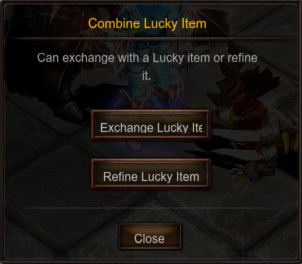 Refine Lucky Item set piece into Jewel of Extension. Items refined with more durability seem to have a higher success rate. Items refined with zero durability have a very low chance to refine successfully.